I have received a few more brackets, which have all been allocated and I have asked for few more for the next aluminium pouring at the foundry in about a month. If you would like to be added to the list of those waiting I will endeavour to get brackets to you as soon as I can. Please contact me if you would like to be added to the waiting list. They are good - I’m a muppet when it comes to bike mechanics, yet a bit of work with fine files, a Lidl Dremmel rip-off, 2000 grit and some Solvol had the casting looking rather nice. Perfect fit and solid mounting using the suggested size of fastener. 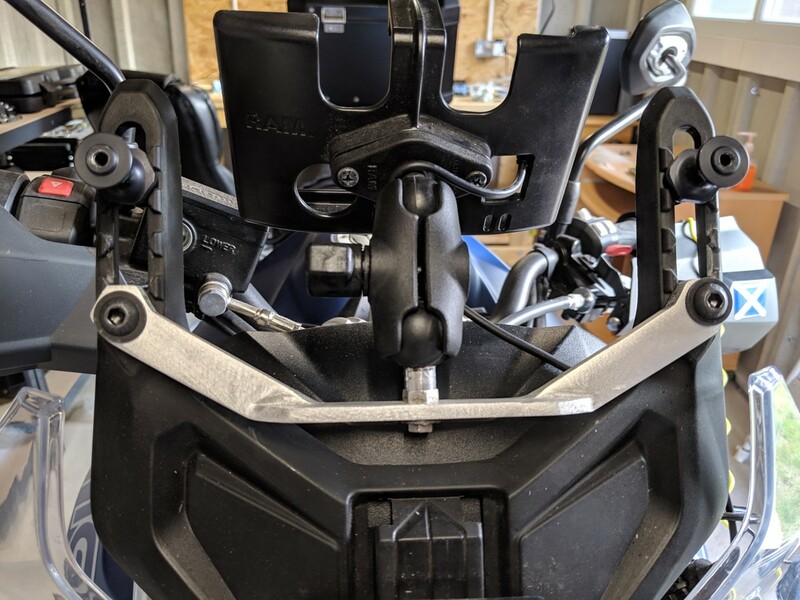 Bolt on RAM mounts are surprisingly expensive - I used one of those kits that replaces one of the handlebar clamp bolts - it had various M8 stainless bolts so just cut one down to size - simples. 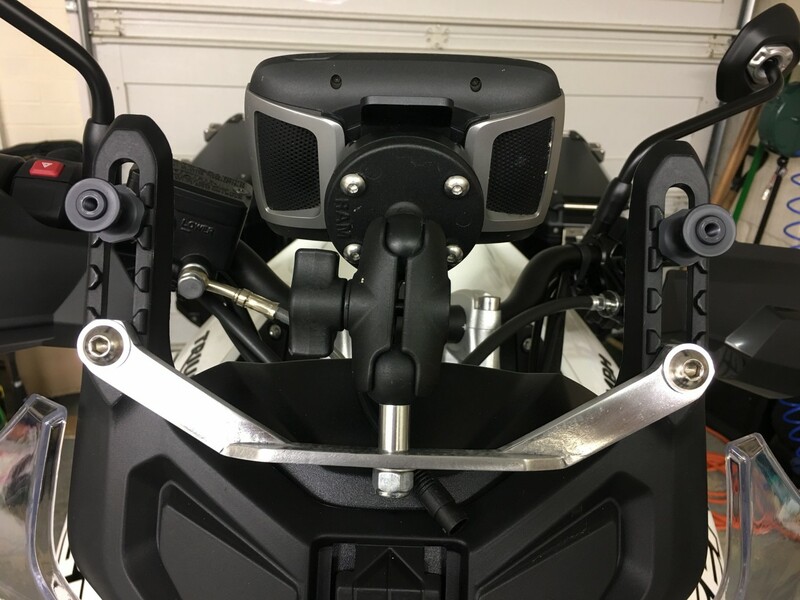 After cleaning up the casting I decided to drill and tap the end fixings with M6 threads and the RAM mount with a M8 thread, finishing all the parts in satin black. This, for me, has the advantage of being able to fit and remove the mount assy without having to remove the screen as I may not want to have it installed all the time. Yet to fix it to the bike. Agreed that they're really great brackets. I use Simoniz Tough Black - no primer needed. 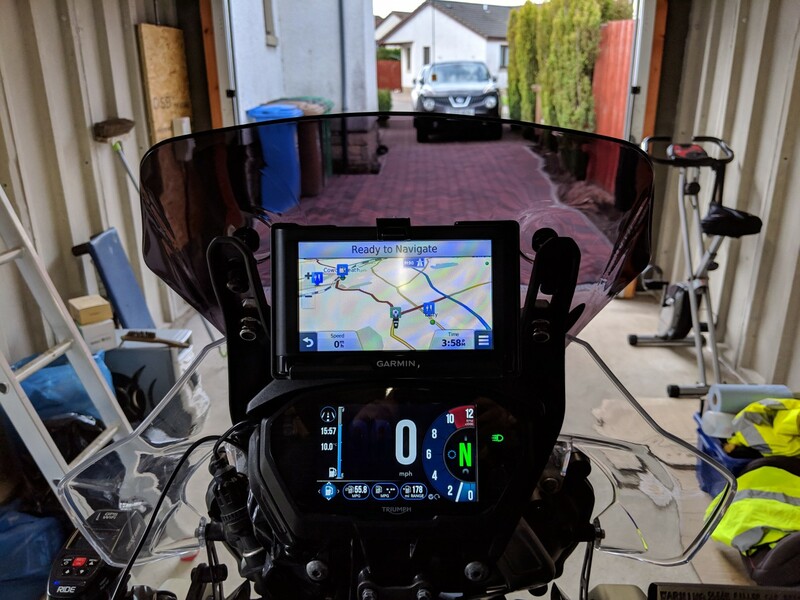 I have recently received a question regarding fitting the SatNav Bracket under the windscreen and now there has been a bit of history doing the fitting I am pretty confident we can now add the information below for those who need to consider the mounting of a SatNav over the instruments and how to add it. Method 2 Another way to fit the bracket is to drill and tap the bracket and with the screws/bolts fitted on the inside and so the screen does not have to be removed. 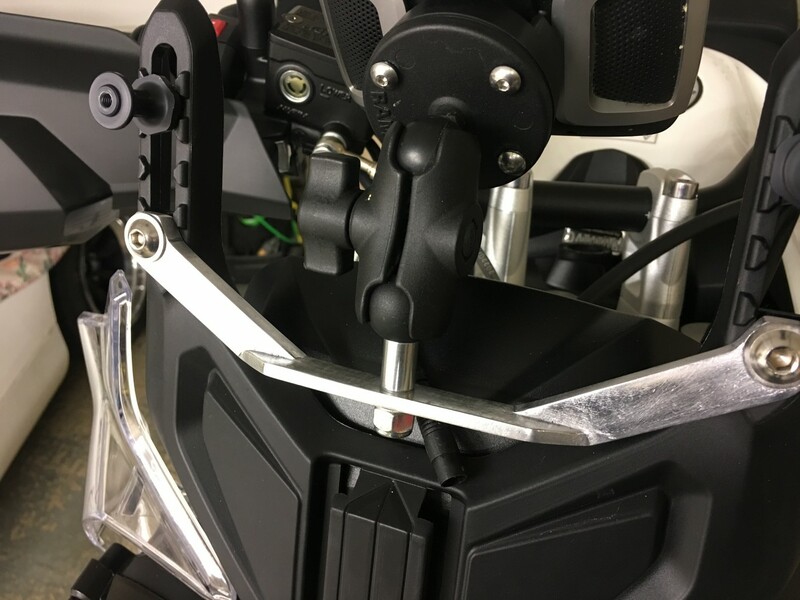 The fixings for Garmin or Tom Tom require a ball that is bolted to the bracket. I only supply a blank bracket as explained in previous posts , copies of this design are possible and have been manufactured by others. Please see all the different posts previously in the forum that describe fitting very easily. And it is only the top two Allen screws that need to be removed from windscreen being careful not to lose the rubber washers. The screen will then be able to be lifted up out of the lower slot. Put the screen on a towel on a flat surface and somewhere safe while its off - you do not want to tread on it or scratch it. 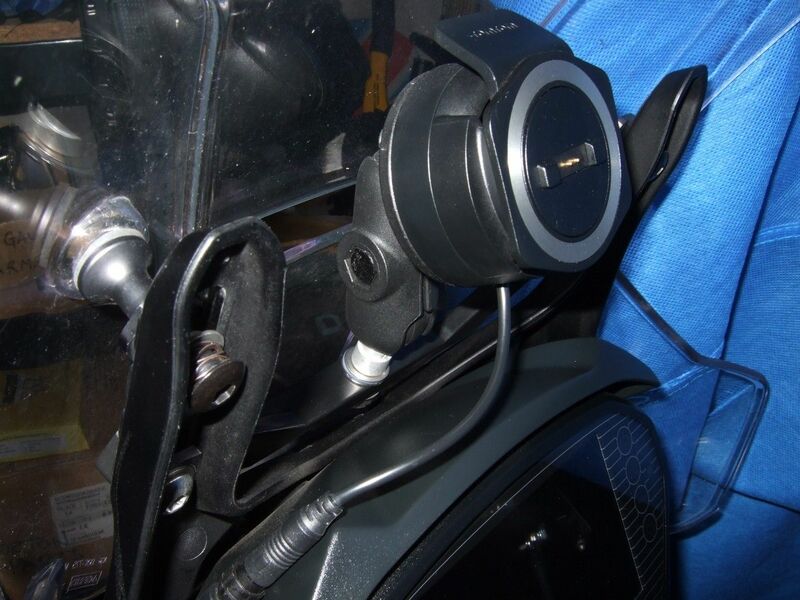 The SatNav mount for Tom Tom / Garmin normally stay attached all the time to the bike and only the Tom Tom or Garmin device are removed for safety. Generally the wiring is a pig to get threaded through the frame and not something you will want to do every time you need or remove the device. I can add advice on threading wire if required. If you are not mechanically minded it is better you seek independent advice. I would be grateful if anyone wants to modify my thoughts and suggestions? Or perhaps they have a method 3 or better way of doing the fitting. Ps I have just added a taller after market smoked windscreen and yet to test, but it should help on those long journey I wish to do. And it does not get in the way of the SatNav Bracket or is restricted by the SatNav bracket. Which was my concern before I fitted it. Also, I have just fitted a Zumo 595 to replace my 660 that has served me well for many years, the 595 is bigger heavier and generally works fine. But I am unhappy with the 595 software. If someone has one can they mail me and I will ask them to try a few things for me to check whether it is common to all 595 devices.